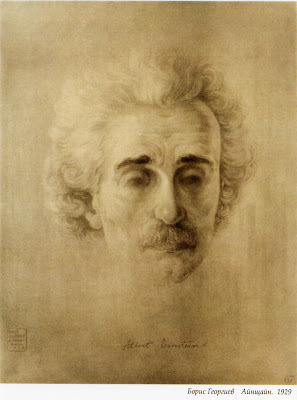 This is a portrait of Albert Einstein - not hard to guess of course. It is another great picture by Boris Georgiev - the Bulgarian artist whom I was referring to in my last post, and whose moving words I quoted. I keep finding these great fellow countrymen of mine from the darker, largely forgotten annals of history. It's not just my intrinsic sense of patriotism that compels me to seek them out; it goes deeper than that even. If one cannot be a 'great' man like the (mostly deceased) people one admires, one can at least extricate the less well-known of them from history's dark matter and at least provide them with some kind of a voice from beyond the grave - give them a 'proper burial' so to say. You have nothing to pay them back with - they are dead after all; but that way, you can 'pay it forward' by making more people of the present hear that lone, long belittled voice for some time to come. The way I see it, it is often the case that there is greater solidarity between the living and the dead than between the living and...the living. For this precise reason I shall continue 'giving them the microphone' with the occasional blog post or two. There's so many of them goddamn it, and they keep popping up like still images of a distant, edenic childhood in the mind of an ageing poet. I feel the urge to lift the veil of historical iniquity and uncover their accomplishments. They've got nothing but their chains to lose! "Your art made me feel in those orbits where, far from earthly harship and suffering, the soul finds peace. After concentrating in contemplation on the portrait of myself, I felt the need to thank you from my heart. As the weak shadows of a transient reality, we feel home-sickness and unfulfilled love towards a different, intangible world. This is felt both by the painter and by his model - each in his own way. I hope you would be able to achieve in your creative process and in future as much as would ever possible for us, the mortal beings. The artist should rejoice in this precise mission that he has." Happy Christmas to all people who rejoice in this precise mission that they have.